Yesterday, along with my colleague Cllr Steve Williams I attended Christchurch School 150th anniversary celebrations. Sadly I could not attend the church service at 2pm because believe it or not with all the children teachers and governors there was no room left. However I went to the school later in the afternoon and was shown around by children who are on the school council the ‘Timeline’ that the children had produced covering the last 150 years, it really was great and like me, I am sure the children learned loads putting this together. We then had a few speeches, and a small buffet, as well as a chance to chat to the children, teachers (past and present) and the governors. Thanks to everyone who put on this event and made this day very special. Heres to the next 150 years! Another Day, Another Christmas Event! This morning, along with Leah Fraser, and the newly elected Councillor for Moreton West and Saughall Massie, Steve Williams we attended the Moreton Adult Learning Centre’s Christmas Bazaar. Like yesterdays event at Foxfield School it was extremely busy. There were lots of different stalls, homemade cakes, books, bric-a brac, homegrown vegetables, grown on site in the garden, chutneys, raffle etc etc. I bought a few bits and pieces as well as raffle tickets, who knows this time? We chatted to lots of the parents, grandparents and students and they were all tremendously enthusiastic about the day and the future. 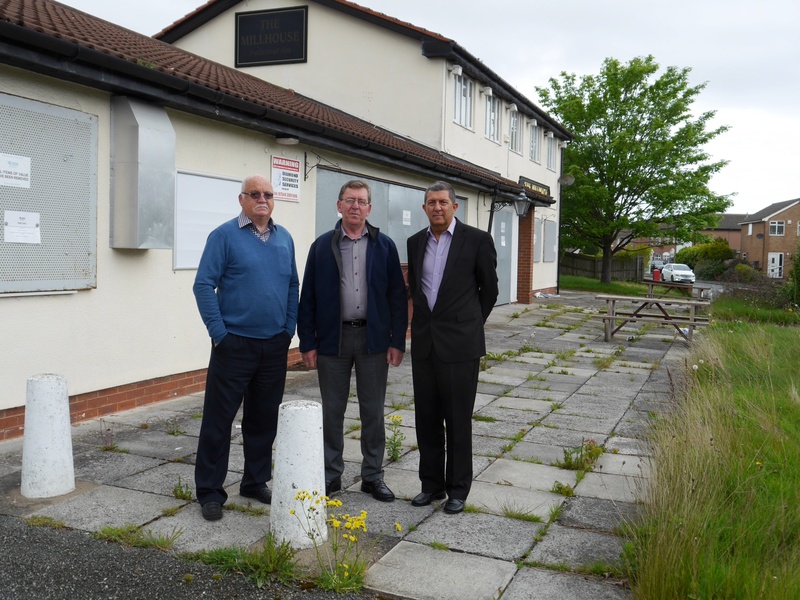 This centre is simply one of the most popular, well used facilities for adults with learning difficulties in the Borough, that is testament to the hard work that everyone who is involved with it puts in. Good luck all, hope you raise lots of funds today. Looks like Seacombe Labour need to go back to school! 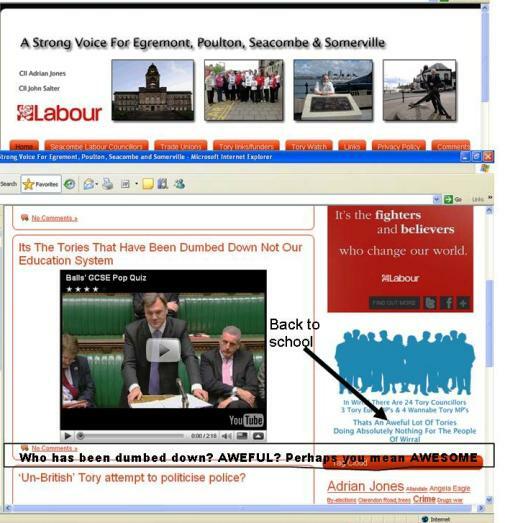 On their site is a You Tube Video with Ed Balls attacking the Tories on Education. I have added an arrow which shows the AWEFUL spelling mistake on the graphic to the right of the Video. The same mistake is on the Upton and Bidston Labour websites. Who is running whose sites? Perhaps they meant to say Wirral Tories are AWESOME? or that they are simply in AWE of us? What Price Our Childrens Education? It seems that the controversial academies programme has now come to Wirral. The Government won’t, or can’t fund the new academies, so it seems that we have to rely on ‘sponsors’, in other words private individuals/companies who do have the cash! But surely, as part of that, the Labour Lib Dem administration that controls Wirral must be careful who they deal with, must carry out checks before any agreements are reached? After all this is our childrens futures. So it was with some shock that I read this exchange yesterday. Questions to be asked, and answers to be given – I think Wirral’s press office will be put to the test. After an exhausting four hours delivering surveys in Seacombe this morning, along with my colleagues, Cllr Ian Lewis and Cllr Leah Fraser I attended Christchurch Primary School Summer Fair. (Leah and me pictured above listening to Insanity Beach) This is the last of the summer fairs being held in the ward, and having attended Foxfield School, and Lingham School, this one was equally as good. I was looking after it for Leah, honest! Apart from all the usual stalls, Coconut shy, Bouncey Castle, Raffles, Cakes, Hot Dogs, Burgers and Ice cream, Christchurch is also blessed with having live music from that well known local band, ‘Insanity Beach’. The music brings a different dimension to the Summer Fair experience. Sadly this year, and the first time for a number of years I failed to knock a cocunut off its post, not sure if they had nailed em on this year! They even gave me a free shot, but sadly my aim was way off target. Never mind! Anyway, Leah, Ian and I has a great time, met loads of people and even had time for a Hot Dog and a 99 Ice Cream. Thanks must go to the PTA who organise the fair, this is their biggest single fund raising event of the year, and I was delighted that the weather, although cloudy, stayed dry and that hundreds of people attended. A great day. Yep it is here again. Last Saturday, along with Leah Fraser I attended Foxfield School Summer Fair. This afternoon, along with Leah and with Cllr Simon Mountney I attended Lingham Primary School Summer Fair. The weather started out really good and the queue to get in was enormous, as can be seen by the pic of Leah in the queue. The fair had all the usual stalls, cakes, face painting, balloons, beat the goalie, a chocolate fountain were we could buy chocolate covered strawberry kebabs, bouncey castle, raffles and much more. Sadly Leah could not stay too long, I don’t know you ladies and hair appointments, however Simon and I had a good look at everything, and chatted to parents and kids. Sadly the weather closed in and the threatened rain hit at about 5pm, and everyone ran for cover. Despite the weather I hope the school made lots of funds to support many of their activities. Tomorrow its onto Christchurch Primary School on Upton Road, 1:30 to 4pm. Library Inquiry – QC Costs shocker! There have been many rumours circulating about how much the Council is paying to be represented by a QC at the recent Library Inquiry at the Floral Pavillion. I have been asked by Steve Maddox to respond to this query. The cost will probably be in the £15-20K range depending on the final time taken on the matter. In the first instance I expect I will pay this from the Legal Fees budget.